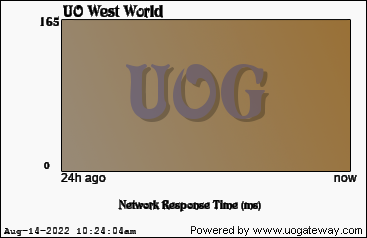 UO West World offers a land for players to easily live the life of their choosing without the grind. The essentials to experience all of Brittania are provided to start, this includes skills, regs, potions, basic armor and weapons. There are many things offered for all player types, including champion spawns, special dungeons and monsters, evolution weapons / pets, special items for faction members, unique items for group PVP, and much more. Currently the map is limited to the areas around Britian, but as the player base expands the walls will fall and the rest of the lands will be available to explore. Stats last updated 4951 seconds(s) ago using 44803 data samples.